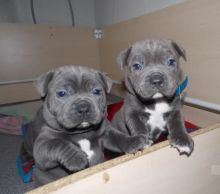 Two beautiful chunky puppy’s looking for forever family home. 1 boy and 1 girl,Puppy’s ready to leave when they are 11 weeks old, they will be vet checked , microchipped , regularly wormed , and 1st vaccination done . Mum and Dad can be seen with a puppy’s as they are family pets , mum & dad cKC registered , . Viewings are welcome and deposit can secure your puppy. Text On ( 204) 817-5731 ) Or E mail me on (paulhulk789@gmail.com ) If really interested.